1. Watch for the opportunity to go with the trend near 12:30. The move may not get rolling until almost 1:30, so be patient and careful. Plan to trade in the direction of the 110 EXMA coming out of that time frame. 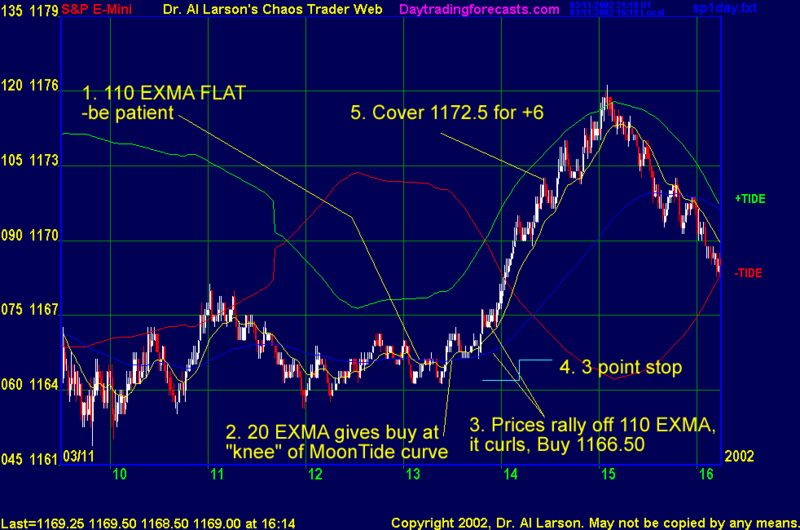 Prices should stay on one side of the 110 EXMA and it should be moving, or curl up or down from a flat position. Prices should be within about 2 points of the 110 EXMA. The 20 minute EXMA should have crossed the 110 EXMA, or dipped toward it and then pulled away from it. When this setup is clear, enter in the direction of the 110 EXMA with a 3 point stop. If this setup is not clear, skip the trade. 3. Cover on a 6 point gain, at 3:10, or if the range reaches 17 points. This trade worked perfectly. What more can you ask for?